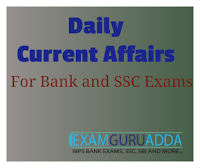 Dear Readers, we are presenting Daily Current Affairs for All Exams- 7th December 2016. 1. Justice Jagdish Singh Khehar (64) will be the next Chief Justice of India (CJI). He will be the 44th CJI and shall succeed Chief Justice TS Thakur who retires on January 3, 2017. 2. Justice Khehar will be sworn in as the CJI by President Pranab Mukherjee on January 4, 2017. With this, he will be the first Sikh to become the CJI. Justice Khehar’s name for appointment as the next CJI was recommended by SC collegium headed by Chief Justice TS Thakur. He would remain in office from January 4, 2017 till August 4, 2017 i.e. till he attains the age of 65. 1. The Reserve Bank of India has kept its key policy rate, the repo rate, at 6.25 per cent. 2. This follows the recommendation of the RBI's monetary policy committee (MPC) which concluded its two-day deliberations today. 3. This was the second meeting of the MPC since its formation two months ago. It was also the second monetary policy review of Urjit Patel, since his taking over as the Governor of RBI on 6th September this year. 1. The Indian Space Research Organisation (ISRO) has successfully launched remote sensing satellite Resourcesat-2A into its dedicated orbit. 2. It was launched onboard of Polar Satellite Launch Vehicle (PSLV)-C36 from first launch pad at Satish Dhawan Space Centre in Sriharikota. It was PSLV’s 38th flight and XL version of the rocket was used. It was the 37th consecutive successful flight of the rocket. 1. Andhra Pradesh Government has launched AP Purse mobile application to promote digital transactions among the people. 2. It was launched by Chief Minister N Chandrababu Naidu in Vijayawada to solve the cash crunch problem in the state following demonitisaton of high value old currency notes. 1. Veteran journalist, political analyst and comedian Cho S Ramaswamy passed away on 7 December 2016 following a prolonged illness at Apollo Hospital in Chennai. He was 82. He is survived by his wife, a son and a daughter. 2. He was the first to propose Narendra Modi as the Prime Ministerial candidate. He was also known to be very close to Late J Jayalalitha, CM of Tamil Nadu who died earlier this week, and also mentored her during her film career and continued to do the same even after she entered the politics. 1. To meet the objective of customer convenience with sufficient security for low-value transactions, the Reserve Bank of India on Tuesday relaxed the additional factor authentication (AFA) requirement for transactions up to ₹2,000 across all merchant categories for online ‘card not present’ (CNP) transactions. 2. This relaxation has been allowed for the ‘payment authentication solutions’ provided by authorised card networks with the participation of respective card issuing and acquiring banks.